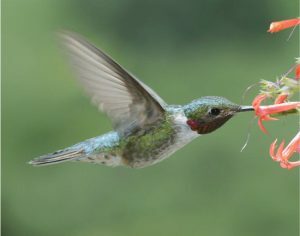 A male broad-tailed hummingbird sips nectar. The phenology of the early-season nectar plants the birds favor is changing more rapidly than the birds, leading to the potential for a mismatch that could affect both birds and their nectar resources. Credit, David Inouye. Today, the US Global Change Research Program released its Third National Climate Assessment (NCA) of the impacts of climate change on biodiversity and ecosystems. The NCA is the most comprehensive peer-reviewed analysis of climate change’s impacts in the United States, informing Americans about the effects of climate change in their backyards. Our planet is already changing. Current climate trends are bringing great disruption to ecosystems and the many species that share this planet—including people, because this is our environment, our home, our life support system. The economic costs of wildfire, drought, storms, fishery losses to ocean acidity, and the inundation of our coastal cities by sea level rise are clear. We depend on ecosystems for the pollination of our crops, the support of our fisheries, the cleanliness of our water—and the integrity of beloved wild areas enjoyed by fishers, hunters, hikers, and boaters. Intact ecosystems improve soil, filter water, store carbon, and cycle nutrients. They buffer communities from urban heat waves, floods, erosion, and storm surge. Reefs, swamps, and coastal marshes, for example, help absorb the energy of big storms. Coastal development has denuded many of these protections, as was dramatically demonstrated in Superstorm Sandy’s collision with New York City and the New Jersey coast in 2012. Grimm, a past president of the Ecological Society, contributed to the third NCA. She guest edited a condensed and illustrated version of the biodiversity, ecosystems, and ecosystem services input to the NCA for a special open access issue of the society’s journal Frontiers in Ecology and the Environment in November, 2013. Find additional details and resources here. Special Issue: Impacts of climate change on biodiversity, ecosystems, and ecosystem services. Frontiers in Ecology and the Environment 11(9) November, 2013 (open access). Summary. Journalists and public information officers can gain access to full texts of all ESA publications by contacting the public affairs office To subscribe to ESA press releases, contact Liza Lester at llester@esa.org. This entry was posted in Press Release by Alison Mize. Bookmark the permalink.